Fulfill the residency requirements. You must be an Ohio resident for at least six months to file for a divorce. 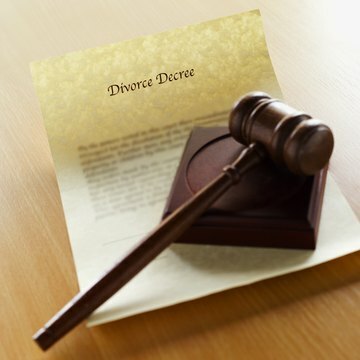 Typically, you should file for divorce in the county in which you reside. Although the local court rules vary, generally if you have resided in the county for 90 days, you may file in that county. Draft a complaint for divorce. In Ohio, you must state your grounds for divorce in the complaint. Grounds for divorce in Ohio include adultery, neglect of duty, bigamy, extreme cruelty, fraud, alcoholism, imprisonment of your spouse, living apart for at least one year and incompatibility. Complete local court forms. The local court where you file your complaint for divorce may require that you file additional forms with the complaint. Contact the clerk of the court to determine what forms are required. The local court may also provide forms for you to apply to have fees waived. Be prepared to submit financial information at the time you file your local court forms, depending on your local rules. File the complaint and any additional forms required with the court. You will file your complaint for divorce, forms and affidavit in the domestic relations division of your local common pleas court. If there is no domestic relations division, file the complaint in the general division of your local common pleas court. Attempt to serve your spouse. After you file your documents, the clerk will attempt to serve your spouse the complaint and a summons by certified mail or personal service at his last known address. If the first attempt to serve your spouse fails, the clerk will attempt to serve him a second time. You will be responsible for fees involved in serving. The clerk will document her attempts to serve your spouse. If the clerk can locate your spouse's correct address and your spouse is successfully served, you can schedule a hearing at least 28 days after successful service. Perform a diligent search for your spouse if the court could not locate him. Contact your spouse’s friends and family, as well as his last known employer; inquire if he left a forwarding address. Perform an Internet search for him. If you are unable to find a more recent address for your spouse, write a letter to the clerk of courts requesting that they serve the papers by ordinary mail -- either at the address they originally served him, or at a new address you provide. Wait about three weeks. Then call the clerk of courts and ask if this attempt at service was successful. Complete an Affidavit for Service by Publication if your spouse was not successfully served. Your clerk’s office may have a form you can use for your affidavit. If the clerk cannot provide a form, draft a document, which states that you cannot locate your spouse. Explain in your affidavit the attempts you have made to locate your spouse and that despite your diligent search, you cannot locate him. Include in your affidavit the last known address of your spouse. Sign the document and have it notarized. You will be required to pay a service by publication fee at the time you file your affidavit for service by publication. Consult your clerk’s office for the current fee schedule. Publish notice. The clerk will publish the notice in a local newspaper. The notice must run in the publication for six weeks. After the six weeks has passed, the newspaper publisher will provide an affidavit stating that the publication ran for the required time and a copy of the published notice. Once the publisher has provided the affidavit and copy of the notice, you may schedule a hearing. Attend your hearing. At the hearing, you should present evidence to the judge as to why your divorce should be granted and how property should be divided. The judge will consider the evidence you present and will issue a judgment entry to address property issues and a divorce decree that legally ends your marriage.